We discover and apply scientific engineering principles and methods to the processes of our natural world and provide advanced graduate education to engineering professionals. From solar drying and pasteurization research in the 1970’s to today’s emphasis on biological waste analysis and treatment, chemical transport through soils, food engineering, bioenergy, bioproducts, and more, our department has a long history of technical environmental stewardship, research, and education. The researchers and graduate students of this department come from all corners of the United States and the world. Because of this diversity, our students leave here with the global awareness, the advanced education, and the technical expertise to become the key players in the economic, technical, and environmental challenges that face us all. These are exciting and challenging times for engineering professionals. These can be exciting and challenging times for you! Call (509) 335-1578 to arrange a tour and meet our faculty! PROSSER – WSU’s Lav Khot will look to reduce reliance on broad spectrum pesticides that result in residues on food with an award from the Foundation for Food and Agriculture Research (FFAR). Khot and his collaborators received one of FFAR’s New Investigator awards for 2018, which includes a 3-year, $300,000 grant. Part of the grant will be used to study the usefulness of ozonated water, or water that has the O3 molecule, also known as ozone, dissolved into it. 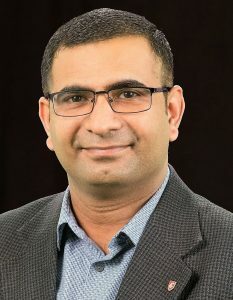 December 4, 2018 | Connected World Magazine | Carol Stream, Ill.
Manoj Karkee, a professor in the Agricultural Automation Engineering specialty area of Biological Systems Engineering has been selected as a 2019 Pioneers in AI and IoT by Connected World magazine. The Pioneers in AI and IoT awards highlight the humane, uplifting, and powerful stories of the IoT (Internet of Things) and other emerging technological breakthroughs impacting the good of mankind. The full article can be found on the 11 Professors Prophecies for AI and IoT website.